I’m going to guess that I’m not the only one whose budget-reality isn’t an exact match for their decor-dreams. Sometimes I’m totally good and patient and other times I feel like my inner Veruca Salt (from Willy Wonka) is screaming “I want it now!” When Veruca appears, spray paint is my antidote. For $3ish, I can either totally revamp something I own, or stretch my budget by turning something affordable into exactly what I want. Adding a fresh item here or there always makes me feel like I’m moving the right direction. When I looked around my house and realized how many different ways I’ve used spray paint, I knew I needed to share them all in one spot so you have an easy reference when you need to calm your inner-Veruca! 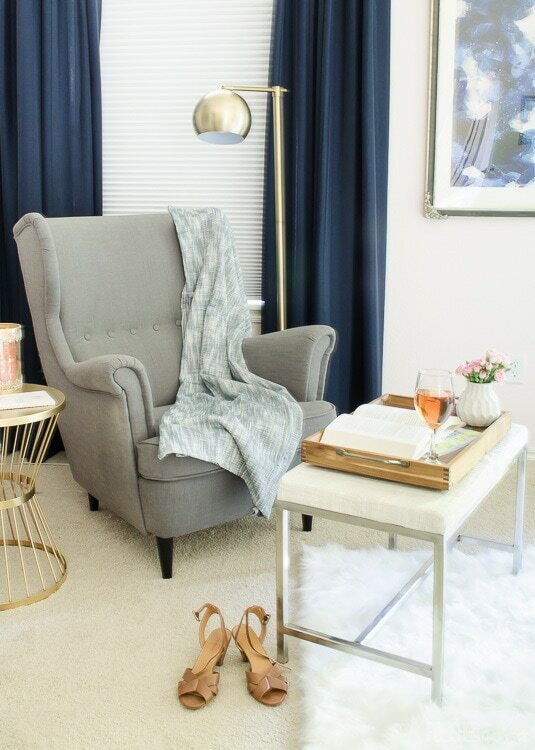 In the bedroom, I needed a glam table by the reading chair. I found some gold wire tables online ranging from $150-$1,500 and loved the style, but the price tags were above what I wanted to spend. I found the perfect solution at Lowe’s! 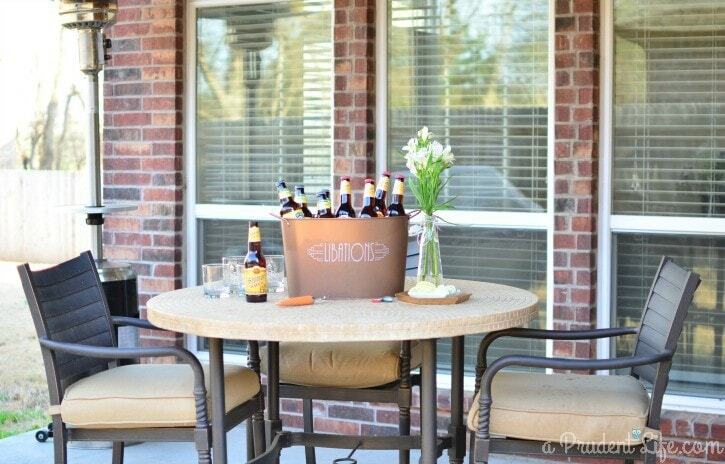 Their $40 outdoor table + spray paint = the perfect solution under $50! After the Super Bowl one year, I found some Pepsi party tubs on clearance. It was perfect for keeping drinks cold, but so UGLY. A couple coats of metallic paint and a vinyl sticker later, it looked expensive! In the pantry, the plastic Dollar Tree bins look metal and have held up surprisingly well after almost two years. 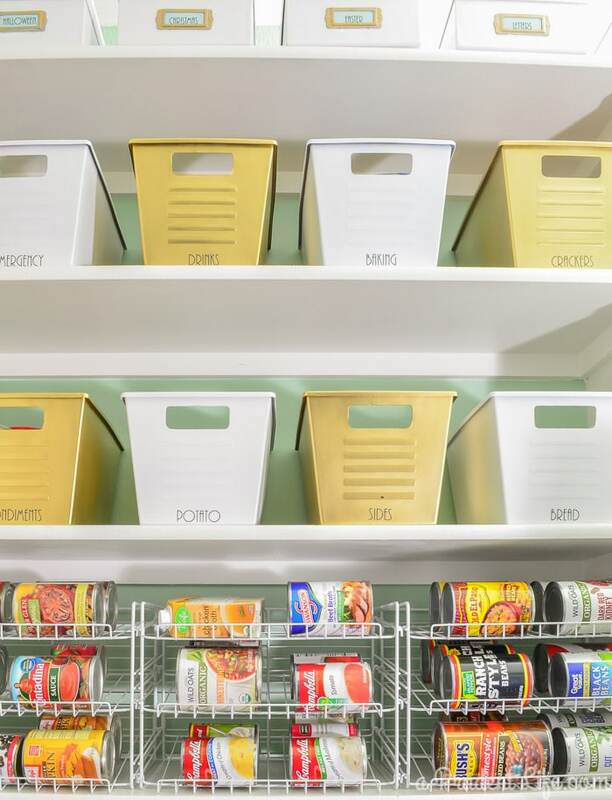 They added a TON of organized storage for just $8 worth of bins and two cans of spray paint. Spray paint is a magic remedy for both old and new lamps and fixtures. 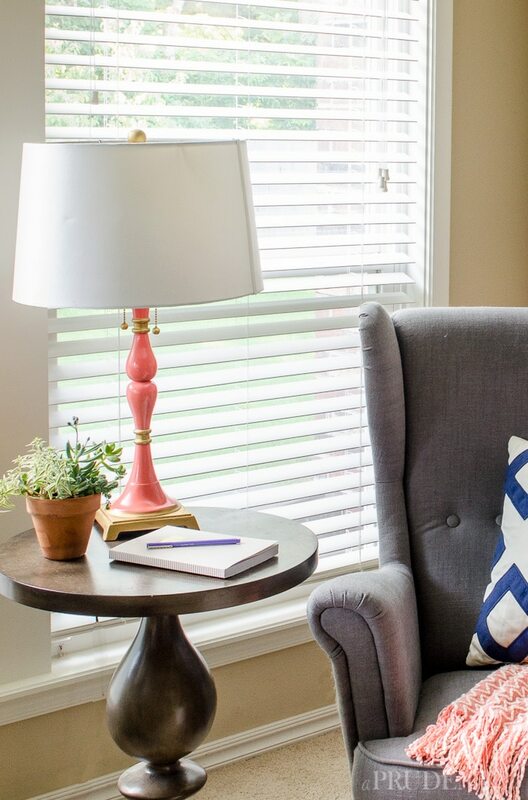 If you’ve got outdated fixtures you hate but can’t replace yet, try painting them to hold you over. I did that with a lamp that wasn’t working for me anymore. Coral glossy paint and some gold Rub & Buff gave it new life. 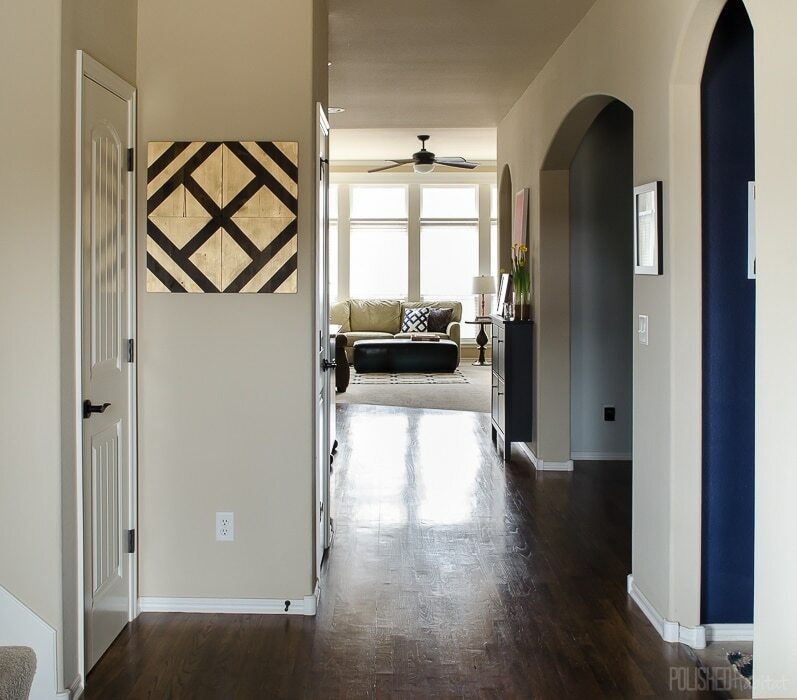 It doesn’t have to be an old light to benefit from a coat of paint. 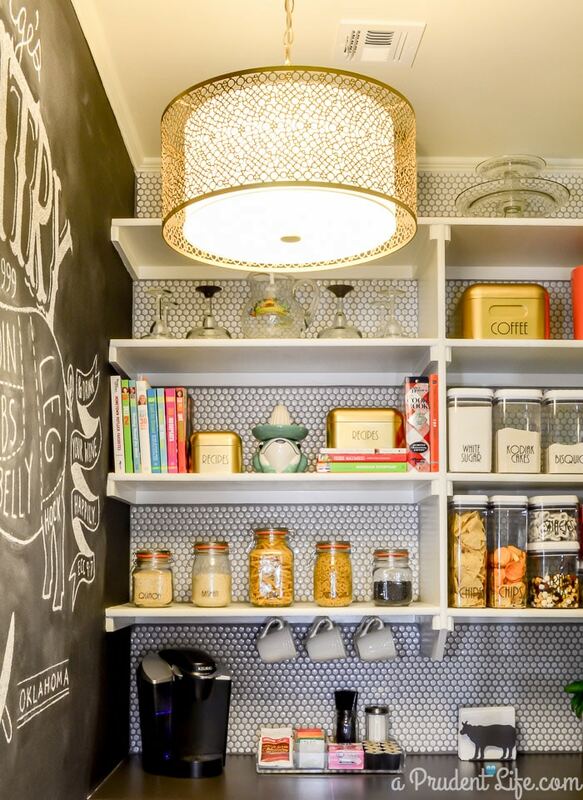 In the pantry, I couldn’t find the light fixture I wanted in my price range. When I found one the right price and shape, but wrong color, I gave it two coats of gold paint and it was suddenly perfect! Tall curtains are expensive, but I desperately needed some in my west facing office. IKEA makes an affordable option, but I wanted something bolder than plain white. Believe it or not, you can spray paint a pattern onto fabric! After using them awhile with daily opening and closing, I do think this would be best for curtains that stay open most of the time. Little black dust-flakes from the paint appear on my white desk sometimes. The curtains still look good, but the flaking isn’t ideal. This one is my ALL TIME FAVORITE! 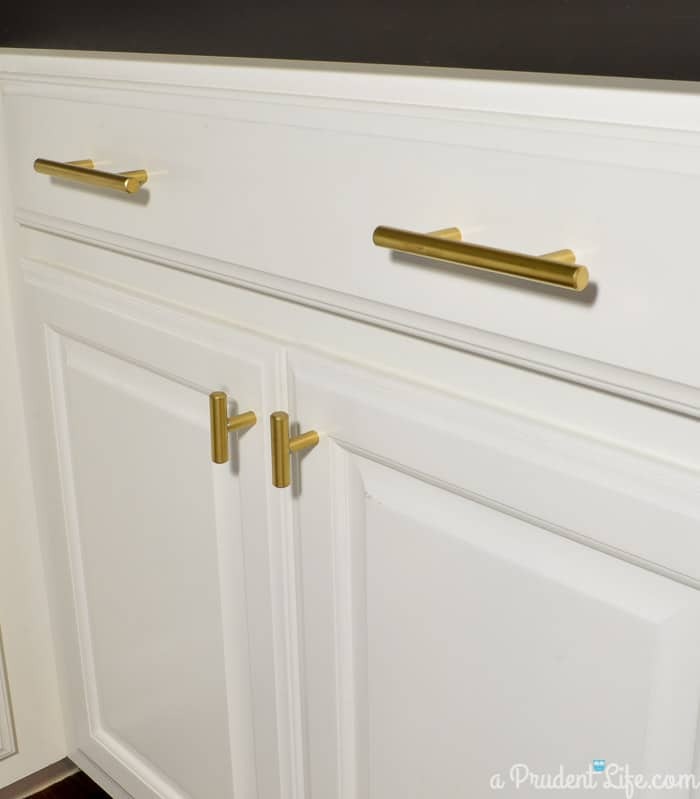 I found the best, affordable cabinet hardware on Amazon (affiliate link). The same style comes in multiple lengths and package sizes, but only in a satin silver finish. 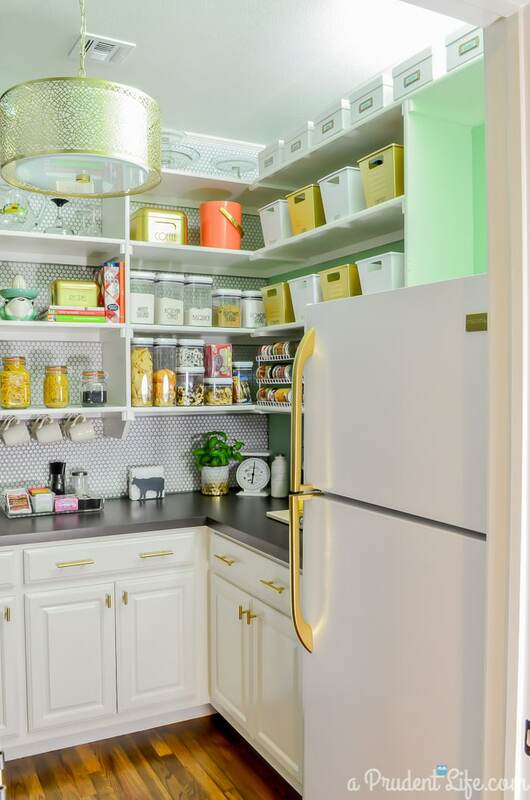 While the original finish is actually really nice, I wanted gold in both the pantry and master closet. Spray painting them has worked out perfectly and they have held up great. Full tutorial here. 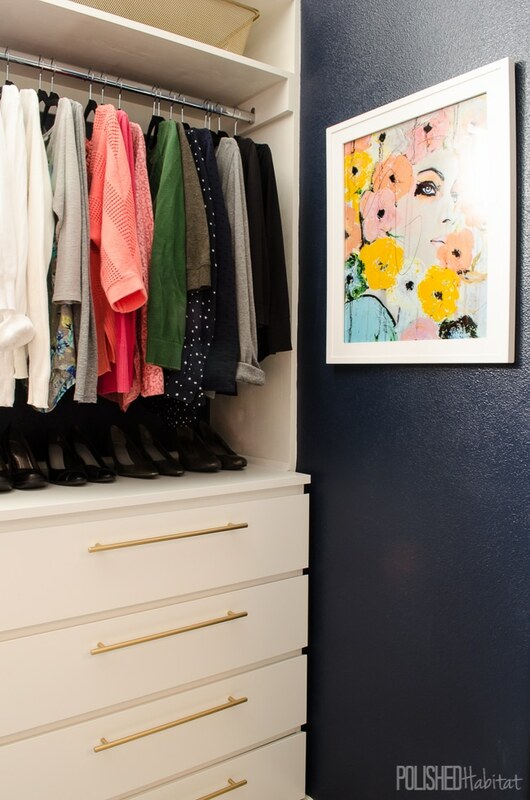 In the closet, I used the 15″ version on our MALM dressers and it makes the IKEA pieces look so much more expensive! Back in the pantry, I couldn’t stop with the gold spray paint. I was adding personality to the space left and right, and the fridge was feeling left out. Since it was a basic, inexpensive model, I got brave and painted the handle and brand label. Now the previously ugly fridge is one of my favorite parts of the room! We have a hard time finding affordable art that we really love, which has left some really boring walls around the house. So far, I’ve tackled two art projects with spray paint, and I’m sure there are more in my future! In the guest room, we used spray paint and wood stain together to get an aged look on cheap fence pickets. 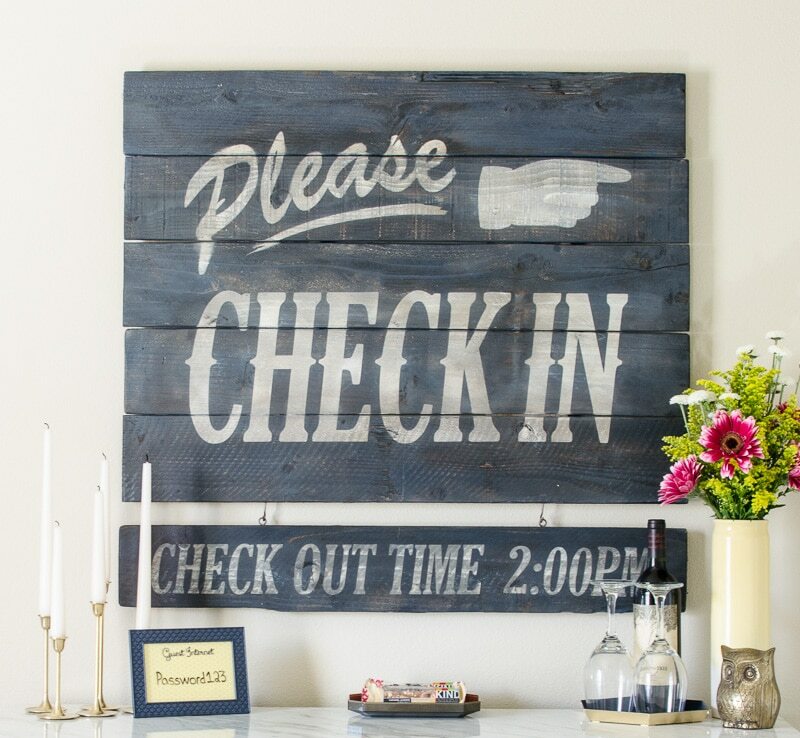 In the entry, I did a much quicker and totally FREE project using scrap wood, spray paint, and tape that we already owned to create a modern, glam art piece. Did you notice the Kleenex box on my nightstand in the master bedroom reveal? I don’t think I mentioned it in the post, but I found a $4 clear glass vase at WalMart that perfectly fit a square box of tissues. Then, I gave it a coat of gold mirror paint to hide the box. Functional beauty at it’s best! Spray paint can make dollar store vases gorgeous as well! Whew! I can’t believe I came up with 12 different projects, and I’m sure I forgot others. 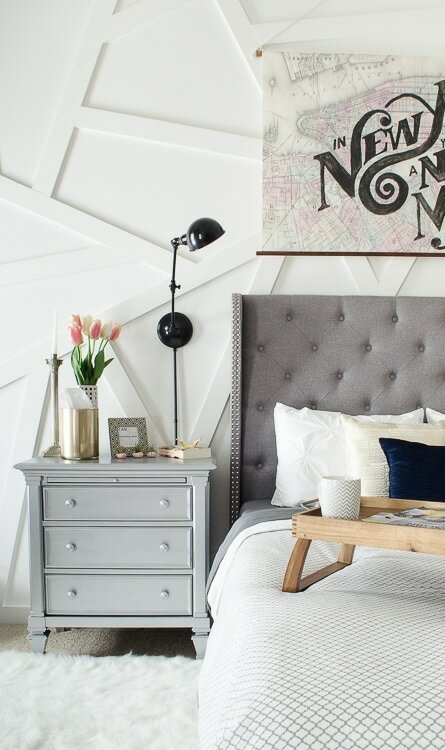 What do you use spray paint for in your decor? Don’t forget to pin the image below to your DIY Projects boards so you’ll have it handy next time you need cheap project inspiration! Ok now i want to paint something. I love the fridge. Ha, I totally can relate to that feeling! I’ve got another spray paint project up my sleeves for later this week and after writing this post I wanted to drop everything and do it right then! We had an old refrigerator in our garage that had seen it’s best days 10 years ago. When we painted and installed new cabinets it really looked awful. My husband spray painted it. The entire outside. It looked brand new. Painting the whole fridge was brilliant! Did you remove the handle from the fridge or tape it off? I went ahead and removed it. I’m not sure if all are like this, but ours was designed to come off easily so it could switch to open the other direction. Are you kidding me with that first table! It does NOT look DIY. And I may need to copy that drink bucket. So good! Thanks so much! I actually forgot about the drink bucket until I started working on this post, I was excited all over again when I realized it was the perfect time of year to get it back out! Those plastic bins look like metal! That’s awesome! Thanks, Dena! Everyone always asks where I got the metal bins! I LOVE this, Melissa! You are totally speaking to me with the limited budget, and I am SO going to use some of these ideas!! THANKS!! The fridge is probably my favorite!! I think you need to buy the gold paint by the carton – you sure have found lots of uses for it!! I really like what you’ve done with the paint. I did my mailbox by the road in a royal blue and even the postmistress knows which box is ours. Ha! It is really dirty since the road is dirt and it is dry here again so I just might need to get some gold paint and re-do it – it would really stand out then. Love your ideas. Thanks for sharing. The royal blue mailbox sounds so fun! Of course, gold would be too! It’s so true! A can of spray paint can fix anything 🙂 It’s amazing the transformations you’ve made with it, and I love all your ideas! What type of gold spray paint is your go-to? I painted a few picture frames gold in the past and after they were touched a few times, I could sort of see fingerprints. Any recommendations? I have two different go-to’s that I”m pretty sure are the same paint in two different cans depending on the store. Walmart and I think maybe Ace have this one: https://www.walmart.com/ip/Rust-Oleum-American-Accents-Ultra-Cover-2x-Metallic-Gold/37326854?wmlspartner=wlpa&adid=22222222227026594198&wl0=&wl1=g&wl2=c&wl3=42973164032&wl4=pla-81465842312&wl5=9026488&wl6=&wl7=&wl8=&wl9=pla_multichannel&wl10=8175035&wl11=online&wl12=37326854&wl13=&veh=sem and then other stores have this can: https://www.google.com/search?q=rust-oleum+stops+rust+gold&tbm=isch&tbo=u&source=univ&sa=X&ved=0ahUKEwi46f7wgdfTAhWKxVQKHVDiC_gQsAQIvQE&biw=1920&bih=901#tbm=isch&q=rust-oleum+bright+coat+gold&imgrc=NNVaql3TTYN_LM: I use them interchangeably and like them WAY better than the fancier ones. I think the fingerprint situation depends a bit on the surface, but I know all our cabinet pulls are used frequently without that problem. Hope that helps! That bedroom is just great, actually finished and clean, and NO PILES on bed or furniture if you can believe it. A little last minutes cleaning of it and the attached powder room and it’ll be good to go. BUT it’s bland. Terribly bland! Other than the light blue and white flowered quilt on the bed, and a white slipcover on the arm chair, and lots of mahogany furniture, I have never finished the decor projects I intended for that room. Once I realized I couldn’t get it done for the last guests, the projects got moved to the end of the list. Spray paint will be the way to go to start adding pops of color which will make all the diff to out guests’ enjoyment! I also really like your glass holder for tissues, and the little framed notice of the passwords for guests, but let’s see how I get on with even one of the projects already listed! I’m so glad it was helpful! And congrats on having no piles in the guest room – I can’t say that about my own at the moment. 🙂 Adding pops of blue around the room will be beautiful with your quilt. I love it when we’re having guests come over because it always motivates me to get things done! I spray paint all my outdoor furniture once a year in a shiny black. Looks great around the pool every year and by maintaining it, I’ve actually had this Costco furniture for 14 years! I buy replacement cushions about every 3 years (need a fresh update with color). That is a brilliant idea! And it reminds me that I need to spray our faded outdoor light fixtures this year.